Toujours aussi radical, exigeant et puissant : Massive Attack a irradié le Zénith de Paris lundi en jouant en intégralité son indémodable chef d'oeuvre "Mezzanine", vieux de 21 ans mais qui en avait au moins autant d'avance et reste plus que jamais cohérent. En visuel, des images vieilles d'une vingtaine d'années : une ville du futur telle qu'imaginée à l'époque et ressemblant à Dubaï, Tony Blair, Saddam Hussein, le World Trade Center, Britney Spears hagarde et harcelée par les paparazzis... On se dit que le monde a en effet bien changé. Une chanson fondatrice : "Robert Del Naja m'a dit un jour qu'il était venu avec un garçon de 12 ans appelé Tricky, à un de nos concerts à Bristol au début des années 80 et que cette soirée avait lancé Massive Attack", raconta récemment sur Twitter le bassiste de Bauhaus, David J Haskins. Massive Attack Angel - 12/02/2019 Massive Attack are an English trip hop group formed in 1988 in Bristol, consisting of Robert "3D" Del Naja, Grant "Daddy G" Marshall and formerly Andy "Mushroom" Vowles ("Mush"). Their debut album Blue Lines was released in 1991, with the single "Unfinished Sympathy" reaching the charts and later being voted the 63rd greatest song of all time in a poll by NME. 1998's Mezzanine, containing "Teardrop", and 2003's 100th Window charted in the UK at number one. Both Blue Lines and Mezzanine feature in Rolling Stone's list of the 500 Greatest Albums of All Time. The group has won numerous music awards throughout their career, including a Brit Award—winning Best British Dance Act, two MTV Europe Music Awards, and two Q Awards. They have released five studio albums that have sold over 11 million copies worldwide. DJs Daddy G and Andrew Vowles and graffiti artist-turned-rapper Robert Del Naja met as members of partying collective The Wild Bunch. One of the first homegrown soundsystems in the UK, The Wild Bunch became dominant on the Bristol club scene in the mid-1980s. Massive Attack started as a spin-off production trio in 1988, with the independently released song, "Any Love", sung by falsetto-voiced singer-songwriter Carlton McCarthy, and then, with considerable backing from Neneh Cherry, they signed to Circa Records in 1990 – committing to deliver six studio albums and a "best of" compilation. Circa became a subsidiary of, and was later subsumed into, Virgin Records, which in turn was acquired by EMI. Blue Lines (1991), was co-produced by Jonny Dollar and Cameron McVey, who also became their first manager. Geoff Barrow, who went on to form Portishead, was an intern and trainee tape operator at Bristol's Coach House studio when the album was recorded. McVey (credited at the time as 'Booga Bear') and his wife, Neneh Cherry, provided crucial financial support and in-kind assistance to the early careers of Massive Attack, Portishead and Tricky during this period, even paying regular wages to them through their Cherry Bear Organisation. Massive Attack used guest vocalists, interspersed with Del Naja and Marshall's (initially Tricky's) own sprechgesang stylings, on top of what became regarded as an essentially British creative sampling production; a trademark sound that fused down-tempo hip hop, soul, reggae and other eclectic references, musical and lyrical. In the nineties, the trio became known for often not being able to easily get along with one another and working increasingly separately. Andy Vowles (Mushroom), who had once thought of himself as the trio's musical director, acrimoniously left Massive Attack in late 1999, after an ultimatum from the other two members to end the group immediately if he did not. 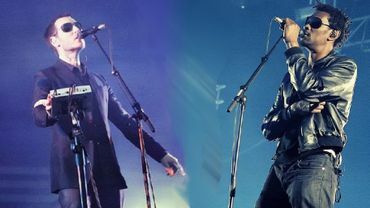 Despite having taken Del Naja's side in the effective firing of Vowles and then participating in a show-of-unity webcast as a duo the following year, Grant Marshall (G) had also effectively left by 2001 in that he abandoned the studio altogether. Marshall returned to a studio role in 2005, having joined the touring line-up in 2003 and 2004.